Winchester, Ind. (April 30, 1972) Ralph Latham made the return of Automobile Racing Club of America (ARCA) new cars to the Winchester Speedway here Sunday a fast and exciting one as he won the 100 lap feature before slim crowd of about 2,500. The race was the first for ARCA at Winchester, since 1964. Latham, from Cincinnati, Ohio, wheeled his gold and white 1972 Chevrolet Monte Carlo to the checkered flag with a three-quarter lap lead over second-place David Dayton, driving a 1972 Camaro. It wasn't all that easy for the popular Latham; however, as he had his hands full with the veteran Les Snow and Bobby Watson until minor mishaps eliminated the competition. Latham trailed Snow for most of the first 74 laps. The veteran campaigner had the right front tire on his 1970 Dodge shred at the 60 lap mark. Latham had run on Snow’s bumper since the 17th lap and eased around the faltering Dodge in the 75th lap and was home free. Three laps earlier, on the 73rd circuit, Watson suddenly dropped from a close third with a broken fan belt after running nose to tail with Latham from the 60th lap. Neil Sceva was third in 1969 Ford with Snow hanging on for fourth and Ron Hutcherson, moving from a trial starting spot to claim fifth. The days only yellow flag came out on the 51st lap when Bill Clemons had the throttle on his 1971 Hornet stick coming off the backstretch, sending him into a third turn span. In maneuvering to miss Clemons' car, Ralph Young put his 1969 Ford into the guardrail. Neither driver was hurt but both were eliminated for the day. The yellow flag was out for 10 laps, wiping out Latham's chances for an ARCA track record for the distance. His time was 37 minutes, 42.01 seconds, more than 2 minutes slower than the existing mark of 35 minutes and 25.74 seconds set by Jack Bowsher in ARCA’s last appearance in ’64. Bowsher's old one lap record on the half-mile high-banks did fall however. Snow you raised the 20.20 second standard with the lap at 18.79. The fastest qualifiers also broke the old mark. 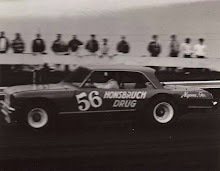 Leonard Blanchard, who ran a strong fifth for most of the first 75 laps before blowing a right rear tire, won the four-lap trophy dash in 1 minute and 16.55 seconds, another track record. Bobby Junior and Ken Black won the first two heats with Latham moving from last in the eight-car field to win the third. Sedalia, Mo. 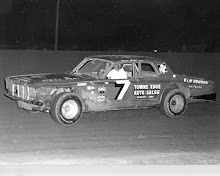 (April 29, 1973) – Drivers from Keokuk, Iowa, all driving Dodges, swept the first three spots on Sunday afternoon in the annual Missouri 100, won in a record time by Ramo Stott. Stott passed veteran Ernie Derr with two laps to go in the United States Auto Club event for late model stock cars on the one-mile dirt track at the Missouri State Fairgrounds. With some 6,000 fans looking on, Don White took third place, two laps behind the leaders. 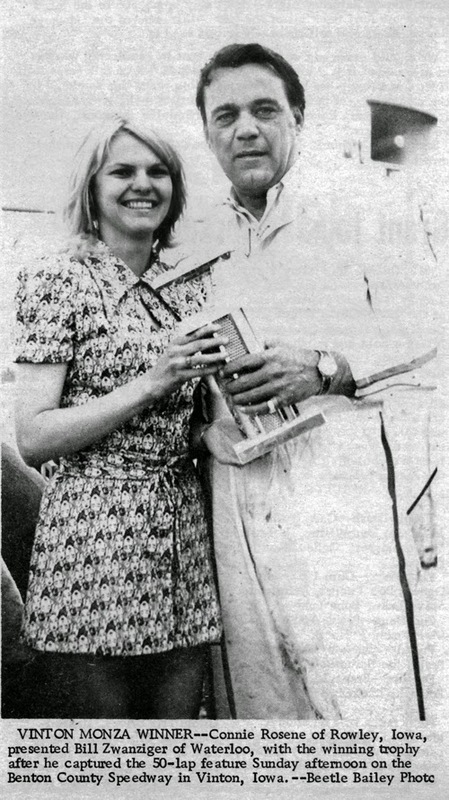 Stott won the $15,000 race in a record time of 1 hour, 10 minutes and 44 seconds, breaking the 1970 mark set by Roger McCluskey of Tucson, Ariz., driving a Plymouth, of 1 hour and 16 minutes. The average speed of the race was 84.819 mile per hour. 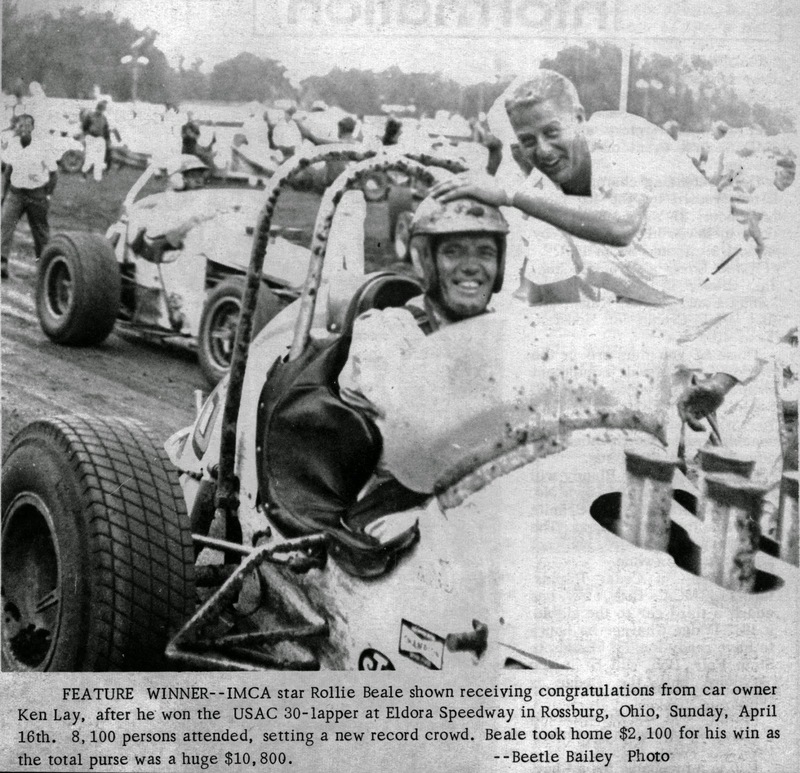 The 100-miler was run without caution flags and provided Stott his second consecutive USAC victory. He won the 100-lap feature at Knoxville on Saturday night. 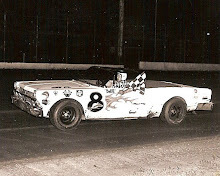 Jack Bowsher of Springfield, Ohio, led the first 57 laps before his Ford Torino blew a head gasket. Bowsher had earned the pole position by qualifying with a lap record of 38.17 seconds. Al Unser of Albuquerque, N.M., completed only two laps in his Rudy Hoerr Ford before dropping out with a faulty oil pump. 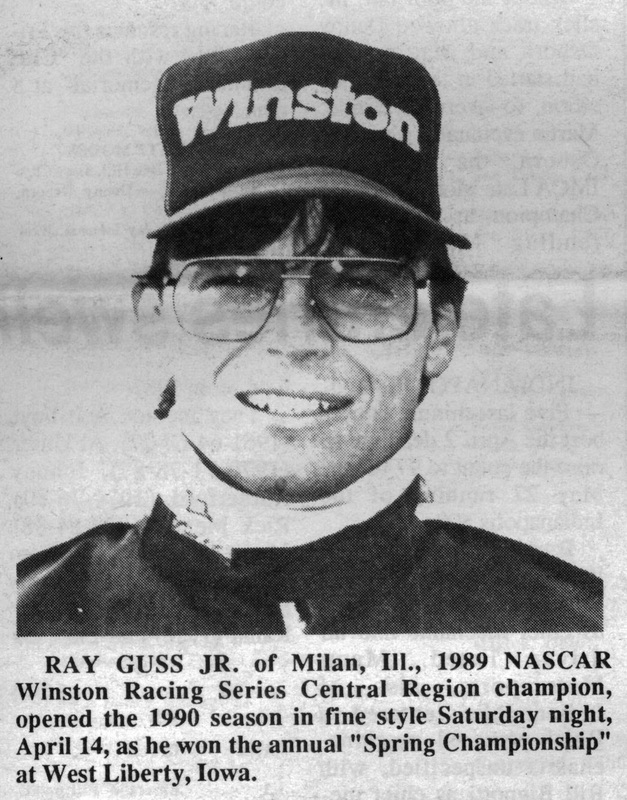 The two-time Indianapolis 500 winner finished 19th at Knoxville. Alton, Ill. (April 21, 1979) - Wib Spalding, experienced carpenter and respected area stock-car driver, wants to add another success story to his already crowded lifestyle. He’s hoping to become Wib Spalding, the profitable owner of the Godfrey Speedway race track. Spalding, a native of Granite City, has purchased the track from Clay Landon, the Speedway owner the past six seasons. Landon, a former school teacher and coach, packed his bags and moved to Arkansas. Enter Spalding, age 45 and a weekly driver at the Speedway during the 1950's. Wib’s web of intrigue begins tonight when the 1979 season gets under way at the Godfrey track, located off Route 67 near Bethany Road. Time trials are set to start at 6:30 with the racing show beginning about 7:30. The Speedway season will run through September. During the Landon years, the Speedway kept a similar format; late model stock cars, semi-lates and amateurs. Spalding will revise the system a bit. Spalding said he also intends to keep some of Landon's innovations such as: point standing charts in each classes, awards, mid-season championships and end-of-the-season championships. However, he is phasing out the “street car” special event because of possible insurance problems. Presently, Spalding and his family are huddling in a camper at the track. The Spalding's, who have been virtually living at the track the past three weeks, make their residence in Granite City. Wib said be is working daily in an attempt to get the track in suitable condition for Saturday's opener. “We have had some problems caused by the rain in the parking lot. But overall, it's in pretty good shape,” he said. Admittedly, purchasing any racetrack is a gamble, but Spalding likes the odds. He thinks the speedway can become a successful business and pleasure venture. The oval speedway track is currently a quarter-mile. “I don’t think we could make it into a half-mile track but it would be comparable with that kind of track,” Spalding speculated. The Granite City (Tri-City) Speedway track that Spalding drove on for a number of years featured a half-mile set up until 1978, when it was converted to a quarter-mile ring. This season, however, the Tri-City track is once again a one-half mile length oval. 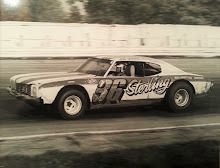 Spalding was somewhat of a local legend during the salad days at Tri-City Speedway. Spalding won several point titles and various major races. He rates his championship in the 100-lap open competition race, the final event of the 1977 season, as his biggest thrill at the track. But Spalding's days go beyond the recent years at Granite City. “I ran two months one season at the Godfrey Speedway during the 1952 season and I drove there in 1953. In fact, I drove there until the speedway closed,” said Spalding, a carpenter by trade. 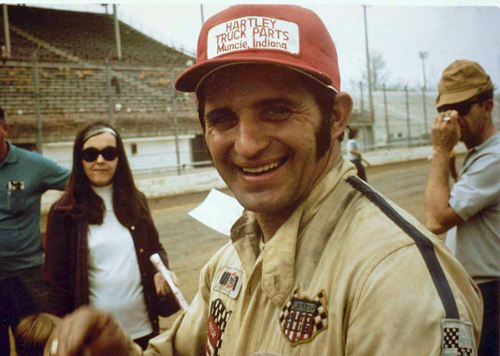 Although Landon helped to reopen the speedway during the 1978 season, Spalding preferred to drive at Granite City. “I liked the big track in Granite City,” he added. Spalding is crossing his fingers that he and his fellow drivers will enjoy the new look Godfrey Speedway just as much. Familiar names like Lou Janssen, Mike Hammerle, Jake and John Sects, Randy Butler, Kevin Goss. Lou Thery and George Carroll, just to name a few, are expected to continue motoring around the speedway track. Spalding hopes to add a few more drivers, too. “I have a lot of friends in this area and I know that 86 cars ran the final week of the season last year. I don't think we will lose a car,” he stated confidently. If that's the case, Spalding shouldn't have too many problems adjusting his repertoire from speedway driver to speedway owner-driver. Winchester, Ind. 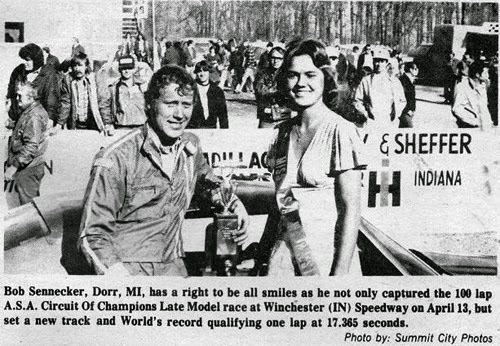 (April 13, 1975) - After blazing to a new world record for paved half-mile track in qualifying with a second lap (103.681 mph) around high-banked Winchester Speedway, Bob Senneker of Dorr, Mich., totally dominated the 100-lap main event for American Speed Association (ASA) late model stock cars today, leave the second place car by two lengths at the finish. Senneker’s record smashing performance marked his second straight win on the Winchester track, having won the rich “Dri-Powr 400” on the ASA “Circuit of Champions” Series last September. He dominated action in the 24-car feature event, racing past really leader Jack Shanklin on lap 4 and steadily increasing the margin on the remainder of the field from that point. 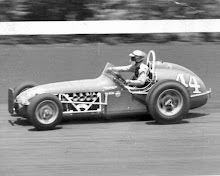 Senneker’s only serious challenger all day long was Larry Moore of Dayton, Ohio, who also broke the old single lap world mark of 17.93 seconds (held jointly by Vernon Schrock and Ed VanderLaan) in qualifying with a 17.907 second lap. Moore kept Senneker in sight until he blew a right front tire on lap 67, necessitating a pit stop. Mickey Flora, of Muncie, Ind., mounted a daring charge by starting deep in the pack and fighting his way to third position in a blue brand-new Ford Falcon out of Jody Ridley’s shop in Chatsworth, Ga. A broken distributor gear sidelined him at 36 laps. Behind Senneker and Moore, however, was a scrap for position throughout the race involving Carl Smith, Harold Scott and Moose Myers. Smith finally took charge until the post race inspection revealed he was short of the required weight, resulting in a post-race disqualification. Smith's misfortune elevated Scott to second in the final standing, with Myers third; Dave Sorg fourth and Don Keevan in fifth. Senneker’s victory was worth $1,115. Winchester, Ind. 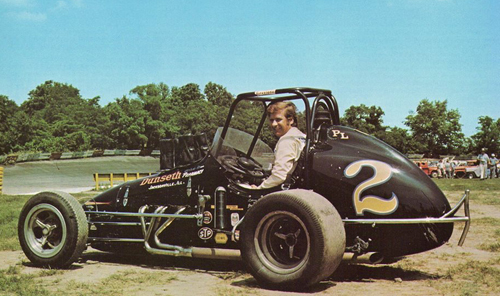 (April 9, 1972) -Larry Dickson has served notice to his fellow USAC sprint car competitors that the winning combination for his Leffler Chevy sprinter has been found. Dickson did so Sunday at Winchester Speedway when he scored a seemingly easy and convincing victory in the 40-lap feature on the high-banked half-mile oval. Starting from the pole position, Dickson throttled his beatuful dark blue sprinter past a strong but outclassed field of 20 starters to gain his 35th career sprint car win. Following a restart caused when Roger West and Merel Bettenhausen tangled in the first turn at the drop of the green flag, Dickson literally blasted past the field in record breaking time. The time for the 40-lap main event was 11 minutes and 27 minutes, 21 seconds better than the track record established by Rollie Beale in 1971. While being interviewed in victory lane, Dickson revealed that it was Larry Dickson, the wrench man, and not the driver who was the reason for the team's poor start during the first three races this season. "I believe we finally have found the right combination for the car and we're going to be a hard to beat out there from here on out," said the two-time national sprint champ. "Probably the main reason for our poor start was because I changed the chassis around, experimenting too much. From now on I'll do the driving and leave the work on the car to Paul (Leffler, the car owner)," he said. 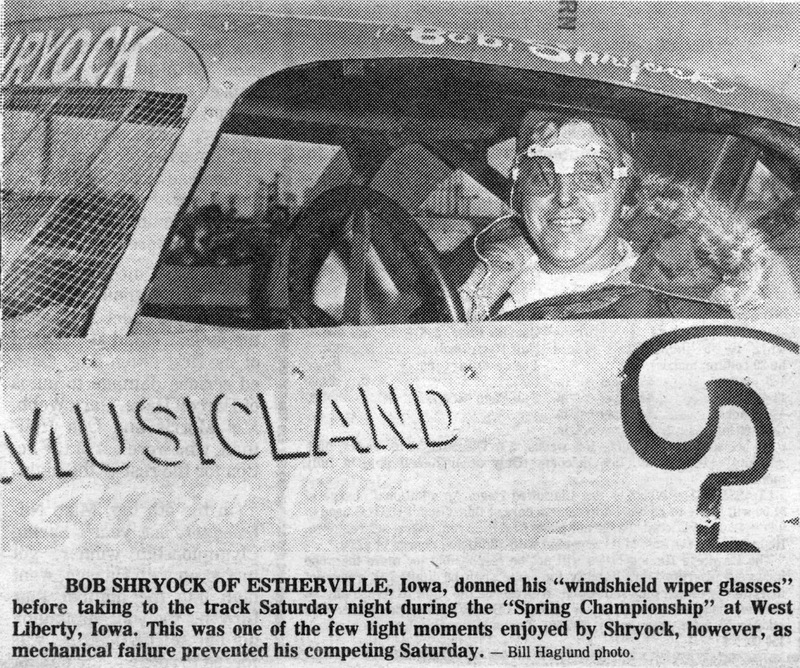 The large crowd that braved the mud and cold couldn't help but notice the different driving styles of two very familiar faces on the sprint circuit, that of Larry "Boom Boom" Cannon and Johnny Parsons Sr. Many of the same fans that were viewing the activities on Sunday were also at Winchester last September when Cannon took one of the worst flips ever seen in sprint car competition. The hair-raising style of driving done by Cannon wasn't to be seen Sunday. Parsons turned in another fine driving performance in the Parsons-Meskowski sprinter, capturing the 12-lap semi-feature and finishing seventh in the main event. 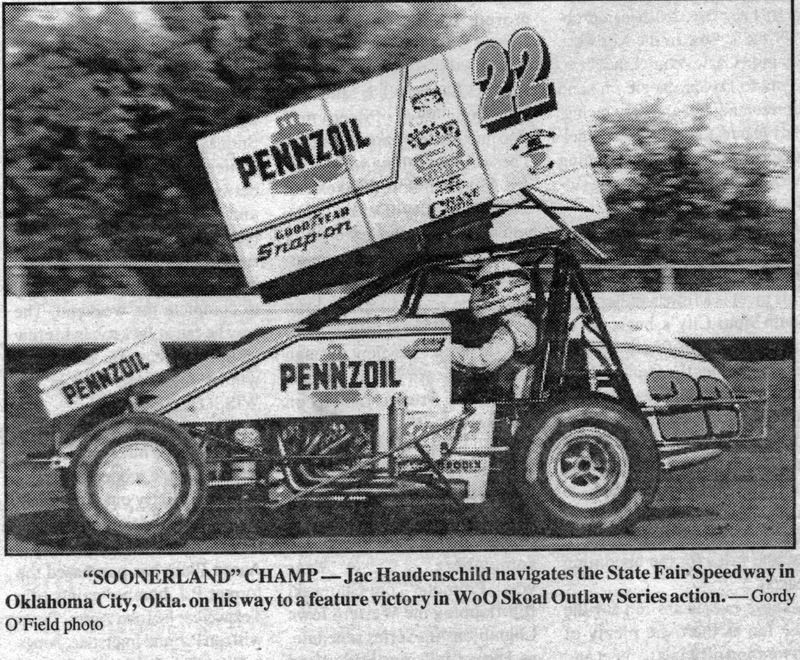 Oklahoma City, Okla. (April 2, 1995) – Just when it looked as though Mark Kinser and Danny Lasoski might take control of the Spring Nationals and the World of Outlaws’ point race, fate and Jac Haudenschild stepped in to turn the tide. Kinser, the early leader in the point’s standings, appeared to be on his way to his second victory of the young season Sunday afternoon at State Fair Speedway when Haudenschild passed him for the lead on the 19th lap. Injury was added to insult five laps later when the top wing supports on Kinser’s #5m Wirtgen Maxim broke, sending him crashing into the turn three wall. The “Wild Child” kept his #22 Pennzoil Maxim ahead of the field during the final 12 laps to claim the $6,000 first prize. The victory, the 15th of his World of Outlaws career, pushed him into first place in the Skoal Outlaw Series point lead. Lasoski earned his third fast time award of the year after pacing the 34-car field with a 17.210 second, 105.590 mph qualifying lap. But a collision with Aaron Berry during the fast dash sent him crashing into the retaining wall in the second corner. “The Dude” drove his backup sprinter past eight cars in the B feature but failed to qualify for the main event. He dropped into 11th in the point’s race. Kinser, the fast dash winner, started the 30-lap A-main on the pole. He burst into the lead as the green flag fell, and opened a three-car-length lead within three laps. He caught the backmarkers by lap six. The “Wild Child” caught Kinser midway through the race, and challenged him for the lead at every turn. Kinser was trying to pass Terry McCarl early on lap 19 when he slid out of the low groove in turn two. Haudenschild took the lead, and opened up a 10-car-length advantage within three laps. Haudesnchild, who set a one-lap record on the semi-banked, half-mile oval last March 27, raced comfortably ahead of the field during the final six laps. He was eight car lengths ahead of the “Buckeye Bullet” Dave Blaney when he took the checkered flag.